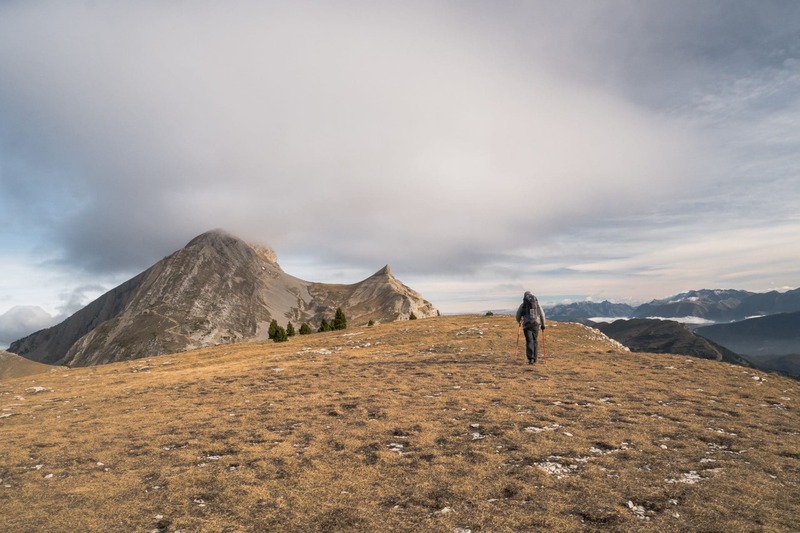 Finding a mountain hike for a few days in November is not always easy but the Vercors was the perfect place: isolation, landscapes, wildlife, altitude, everything you need to walk a few days away from the world. 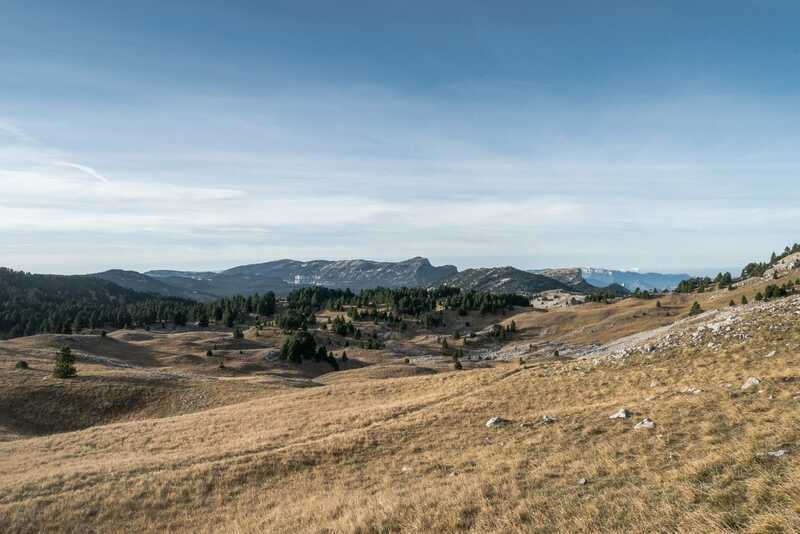 The Vercors is a special place, limestone massif of the pre-Alps located close to Grenoble, it stands out for its isolation and the relative lack of water that reigns there. There is also a rich fauna easy to get close of. 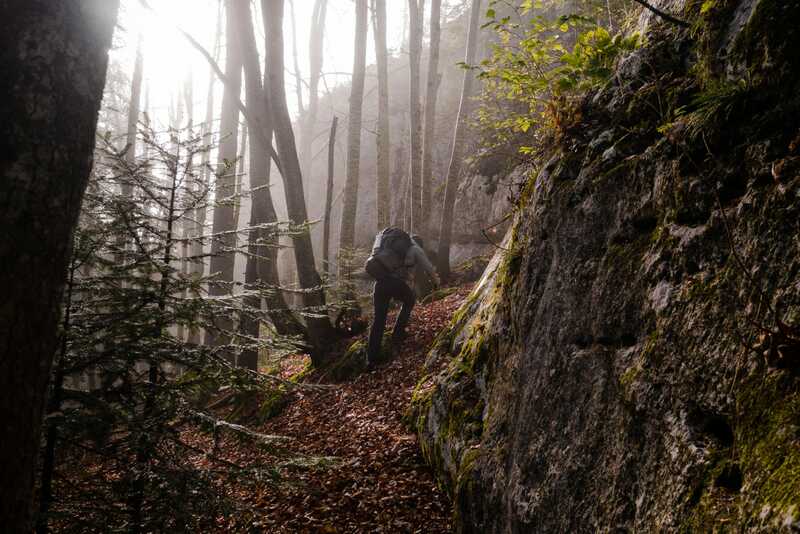 The massif is easily accessible by car or train, which makes transport logistics easier. 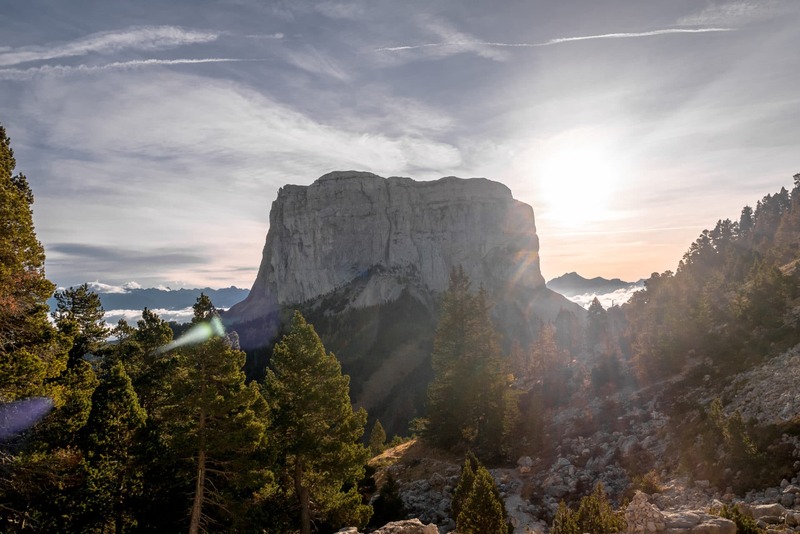 I do not know why, the Vercors and its highlands have always had a reasoning a little mystical in me and it was a long time that I wanted to discover this place. So we sealed the bags for three days at the end of October. 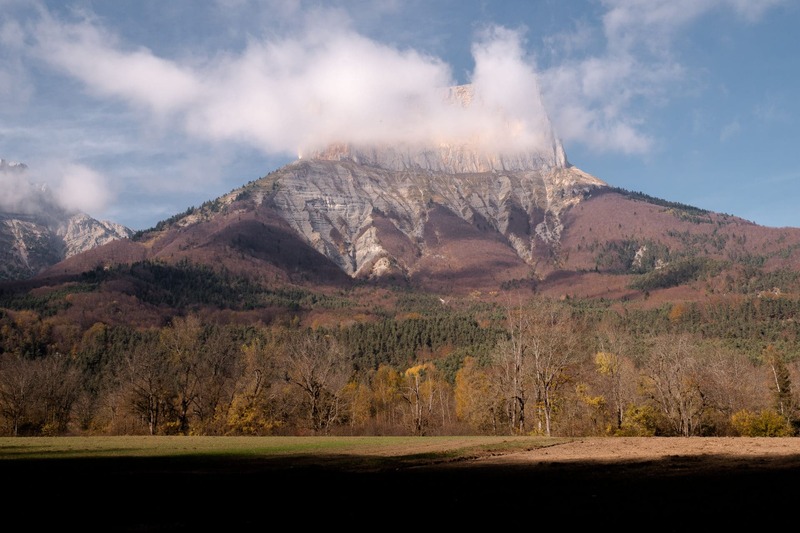 The goal was simple: join Corrençon-en-Vercors from Chichilianne taking the time to savor the fall on the Hauts Plateaux. 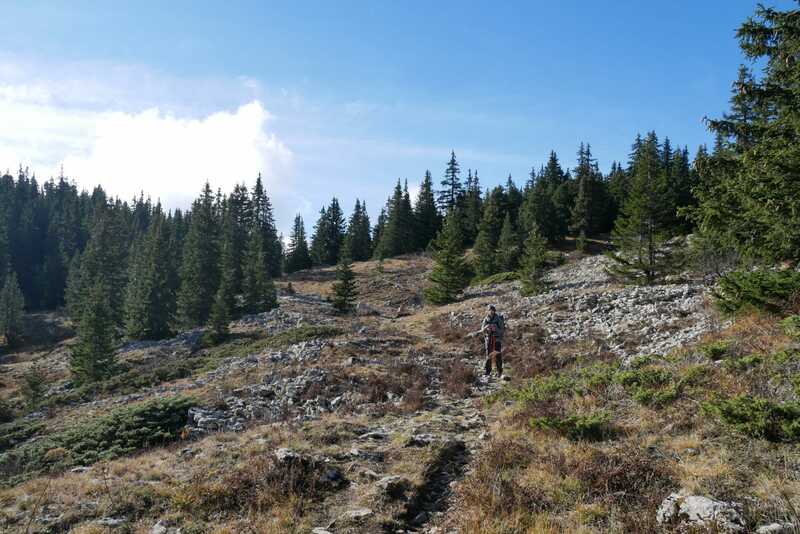 Here is the story of this beautiful autumn trek along the GR91. For this adventure, I will be accompanied by my friend Geoffroy, Jeff for the friends. It is at Gare de Lyon that we meet for an early start towards Grenoble. We will be there 3 hours later O magic of the French High Speed Train (TGV)! For the next part we will take a TER which will deposit us at Clelles. The train station and the village are lost in the middle of nowhere, that’s it, we are there, we can start our trek! It begins with a small disappointment, since Jeff forgot his camera memory card! I will be the reporter for the next few days. 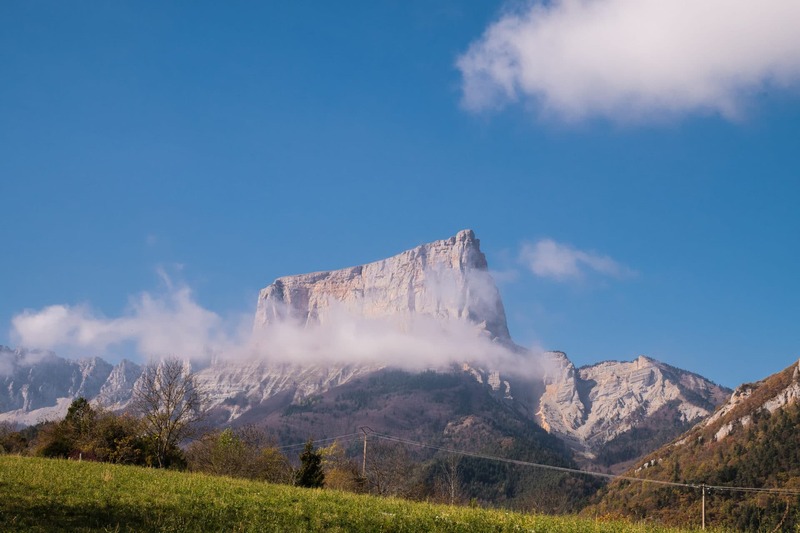 The first stage of the hike is to join Chichilianne and more specifically the Richardière, close to the Mont Aiguille. It is about 13h we still have a few hours before us before dark. 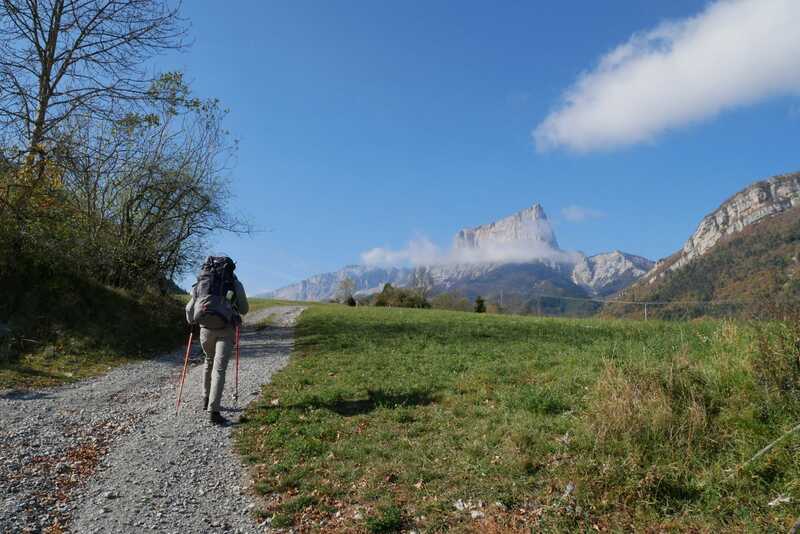 In the background of this first stage, the magnificent Mont Aiguille, rock prominence, alone, at 2087m. 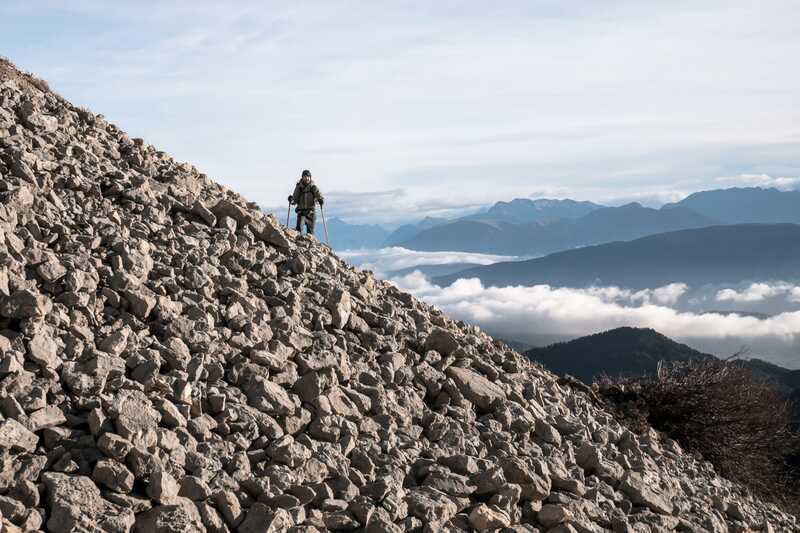 It is a historic place for mountaineering because it is the first “real” ascent made in 1492. 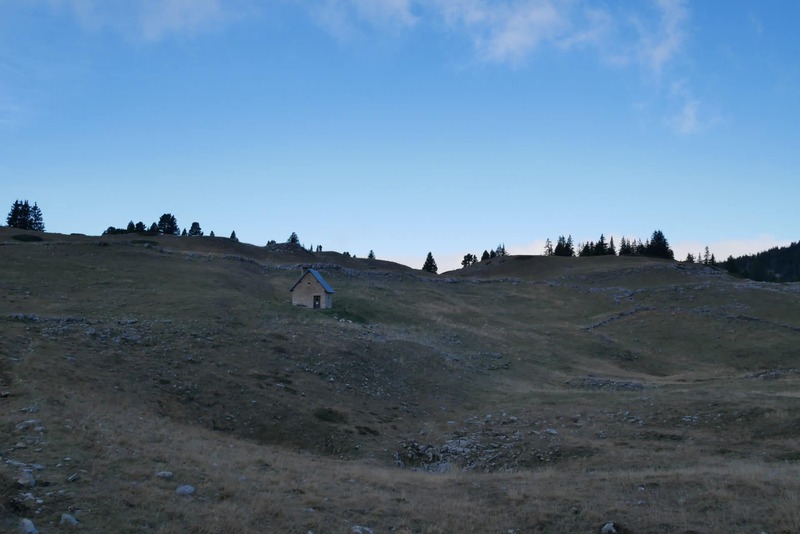 It is also our goal of the day because we intend to bivouac towards the Col de l’Aupet. The path is not difficult until the Richardière and relatively flat. We turn around the mountain that presents us different profiles. 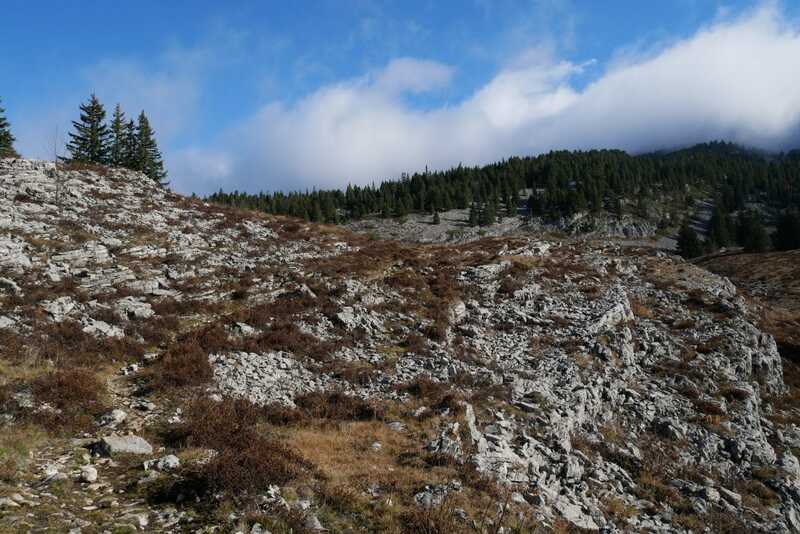 Once at the Richardière (1000m), we begin the climb through the forest of Chichilianne. 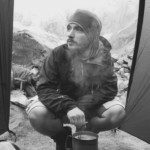 We quickly gain altitude and for my part I struggle a little and I am short of breath. Jeff, he’s in the lead. It is getting late and the sun is falling. 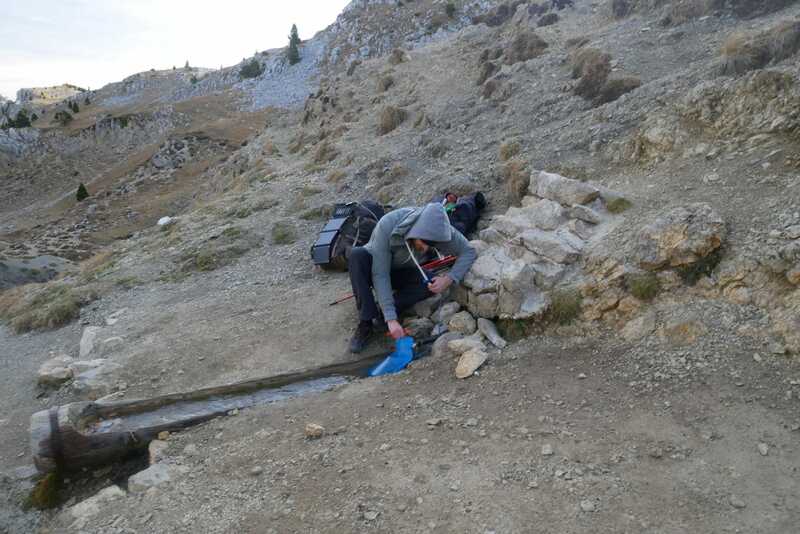 We arrive at the shoulder under Mont Aiguille around 4pm, for my part exhausted … We can not drink as we wish because there is no water there. We hope to find some tomorrow at the fountain of Bachassons. 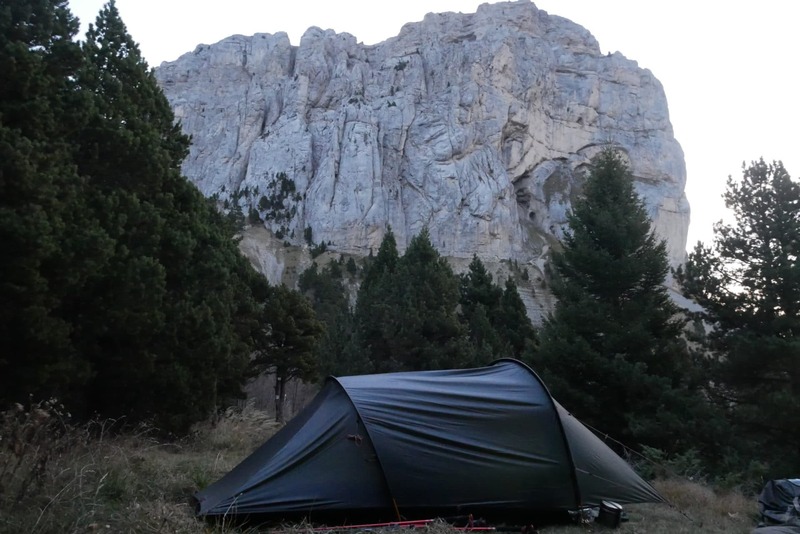 For the moment we install the camp which offers a beautiful view of the Mont Aiguille and the surrounding valley. As there is still light we leave to try to find water on the north side but nothing … we come back empty-handed. The temperature falls quickly and the wind does not help! 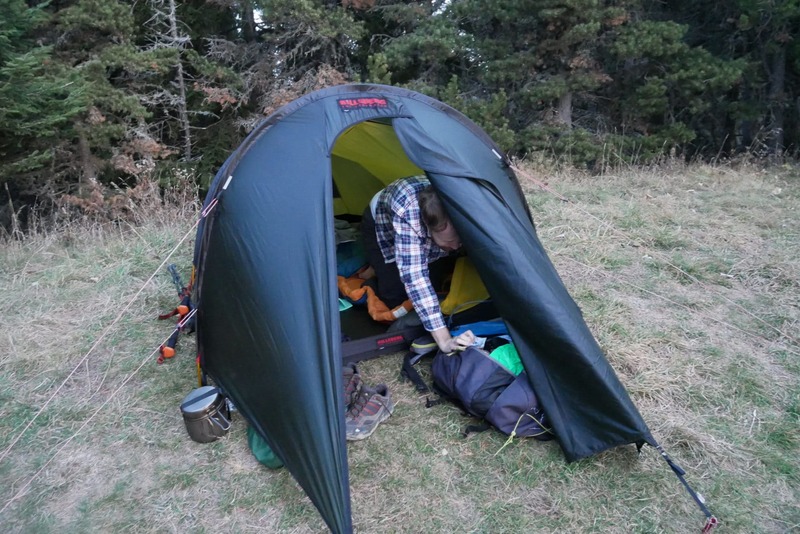 We will take refuge in our sleepingbag very early after a meal taken in a hurry! We have enough water for tonight but we need to find some tomorrow. As often with the first days, the warm up was not easy but we are still happy to be here wrapped up in our sleeping bag. The night was not too cold, we had equipped ourselves knowingly. Dawn holds a glowing sunrise and the weather is sunny, all we need to attack the day the good way! The breakfast has been light and fast because the lack of water does not allow us to make tea or coffee. So we resume the road fairly quickly once the camp folded. 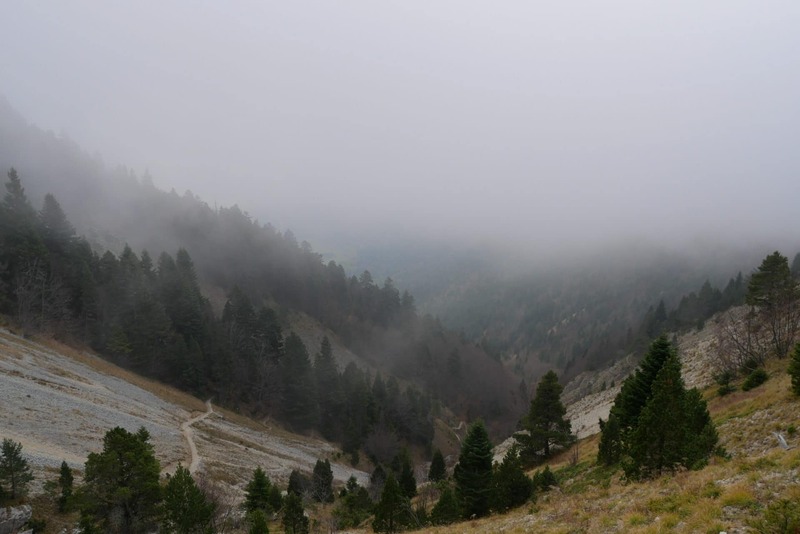 The first stage takes us to Pas de la Selle, which will be our gateway to the highlands. 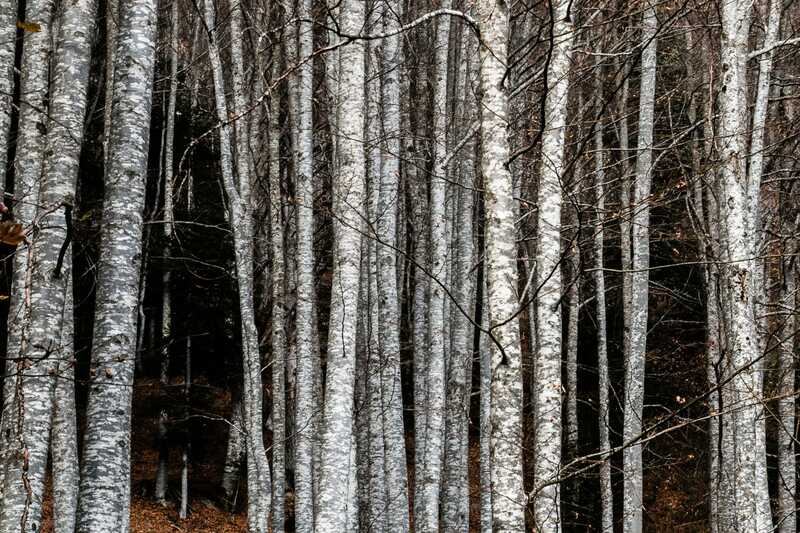 We leave the trees behind us in the climb which is therefore more and more mineral. 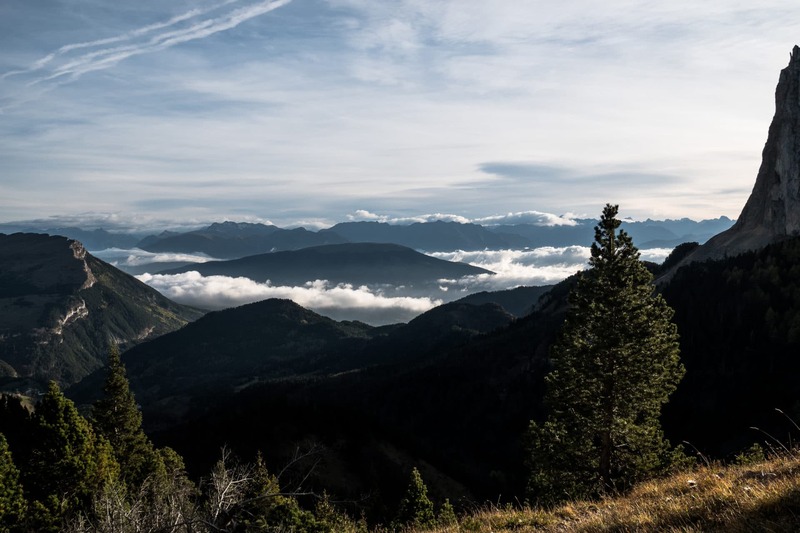 The view to the pass is marvelous: down below the valley covered with morning mists and Mount Aiguille planted there in all its splendor. The arrival at the pass finally reveals the Highlands and it’s worth it! It’s like being in the Rohan of the Lord of the Rings: large heaths of short grass as far as the eye can see with a few trees here and there. It is very beautiful and there is nobody ! We then branch off to the north in search of the Bachasson fountain. 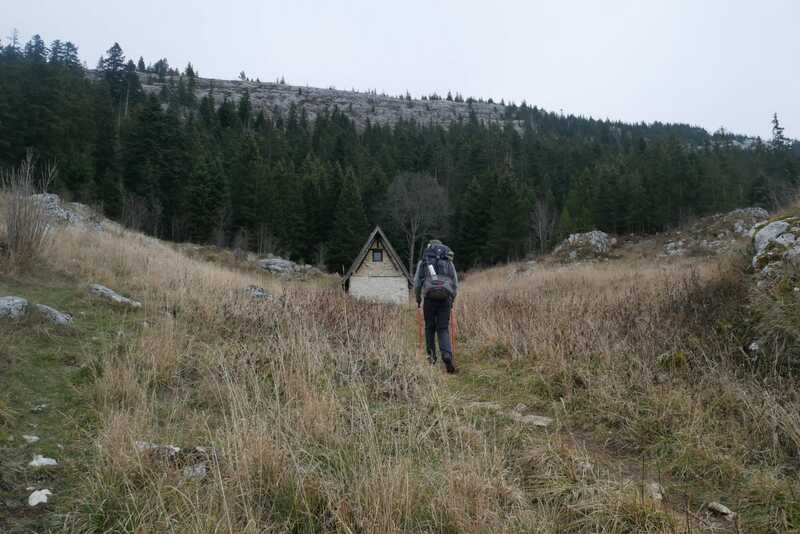 On the road we cross a small hut lost in the land, there is a stop 2min. We are looking for the fountain that we will find a little further. It flows slowly but it flows, it’s already that! We fill our bottles thoroughly (3L / person). 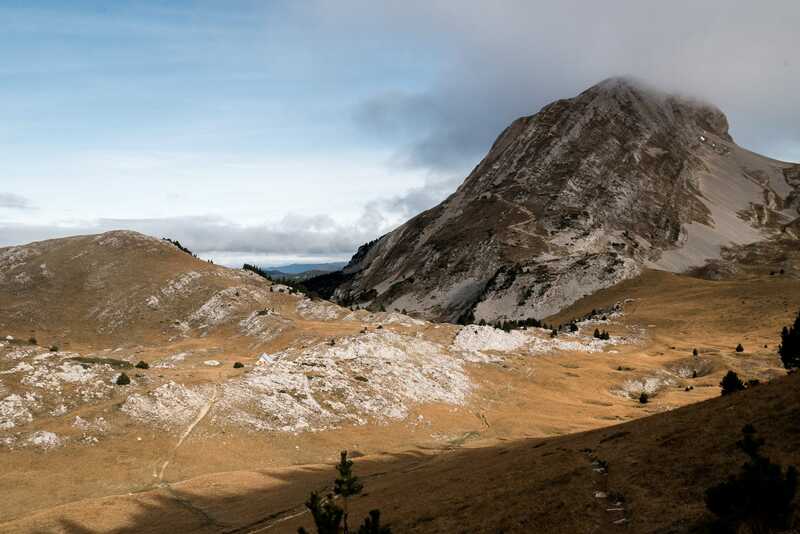 We take the road towards the Cabane des Aiguillettes for a coffee. It’s sunny but it’s very windy. The view is very beautiful with the Grand Veymont (2341m) in the background wearing a pretty cloudy hat. 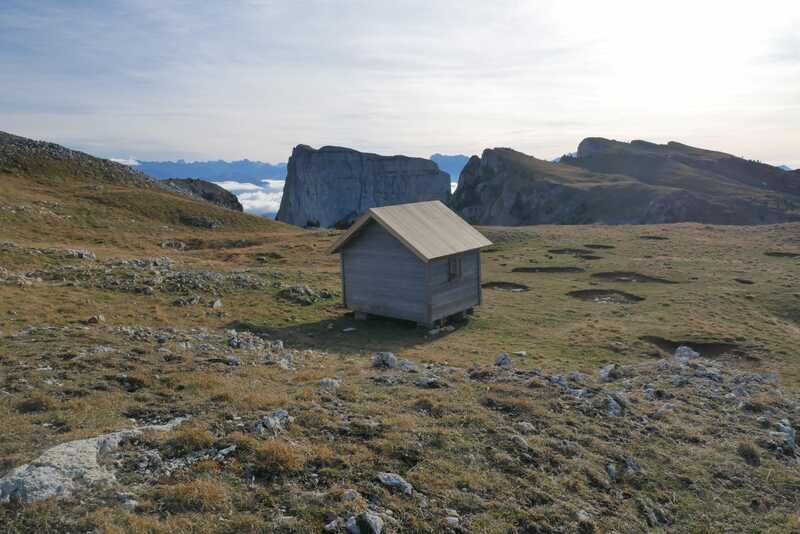 We arrive quickly at the Cabane des Aiguillettes but it is already occupied by other hikers with whom we settle the time of a coffee. We leave after this short break a little “worried” about this water problem … we’ll see. Initially we wanted to climb up the Grand Veymont but as it is all hooded we decide to turn west and recover the GR91 earlier than expected. 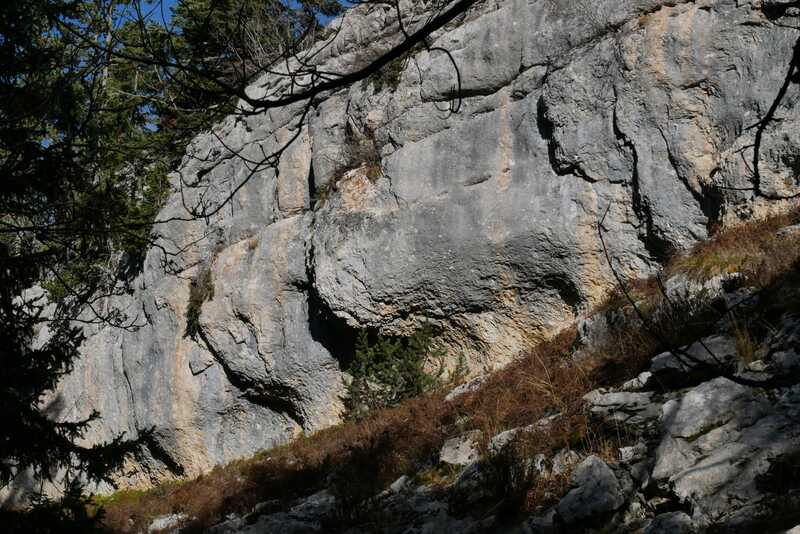 We go through the Pas des Chattons (The Kittens Pass) where we expect a nice surprise! 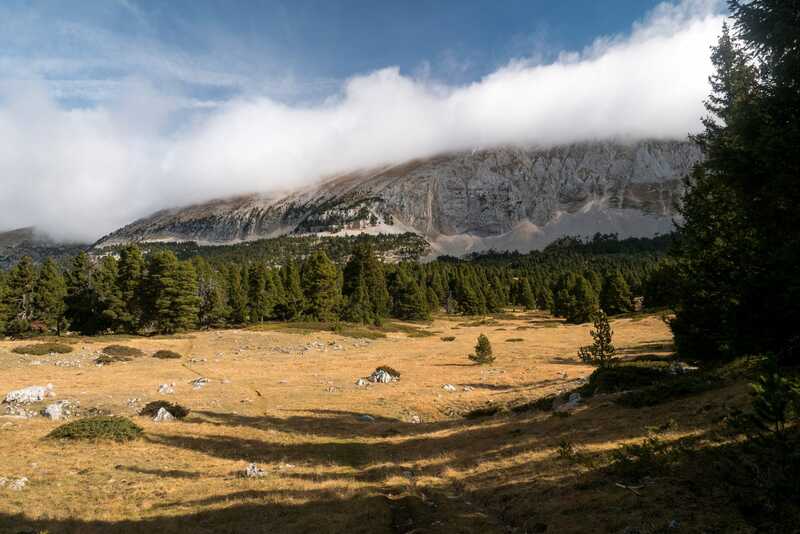 It is here that we expect a dozen ibex literally grazing on the way … We are approaching carefully so as not to scare them to the point of finding ourselves within 10m of them. It is even up to us to shift the path to pass because these gentlemen (there are only males) do not bother to move … We take the opportunity for some photos! I had heard that the wildlife here was not very shy but at this point! As I said we are only males here, the females are higher with their young. The landscape changes quickly after the Pas des Chattons. We are losing altitude, so the trees are coming back in numbers. Those are only conifers however, the conditions being always rough here in winter. We will find, a little by chance, our first Scialet a little further. 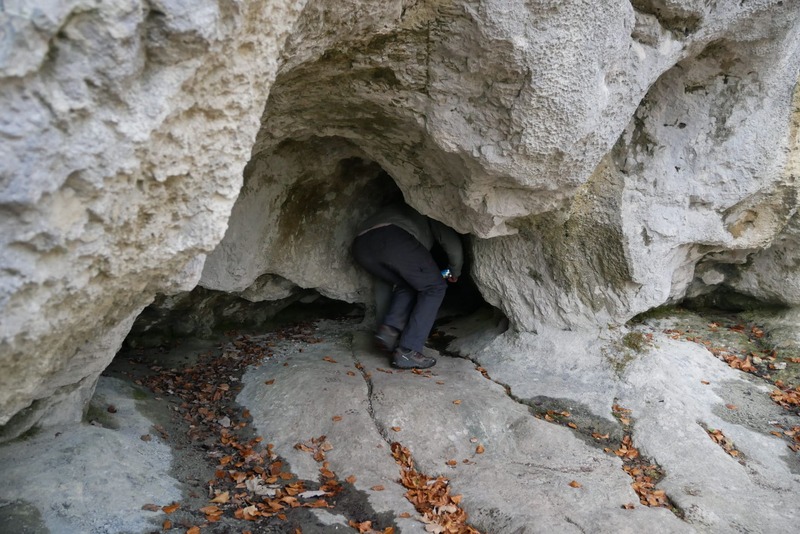 Scialets are kind of bottomless holes (at least in appearance) that are due to the very nature of the Vercors basement. Indeed it is mainly made of limestone and is therefore particularly prone to erosion by water. 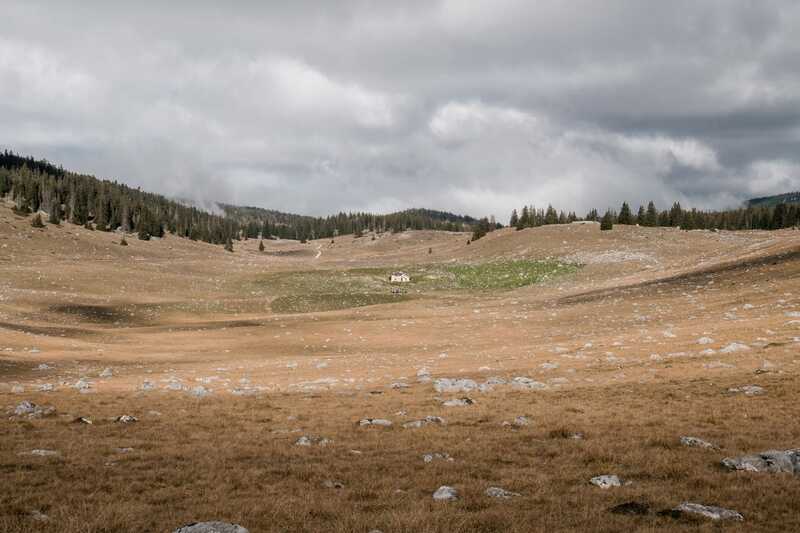 It is also this karstic subsoil that makes the Vercors an area so arid because the water disappears directly into the crevices of the ground. In any case do not fall in! 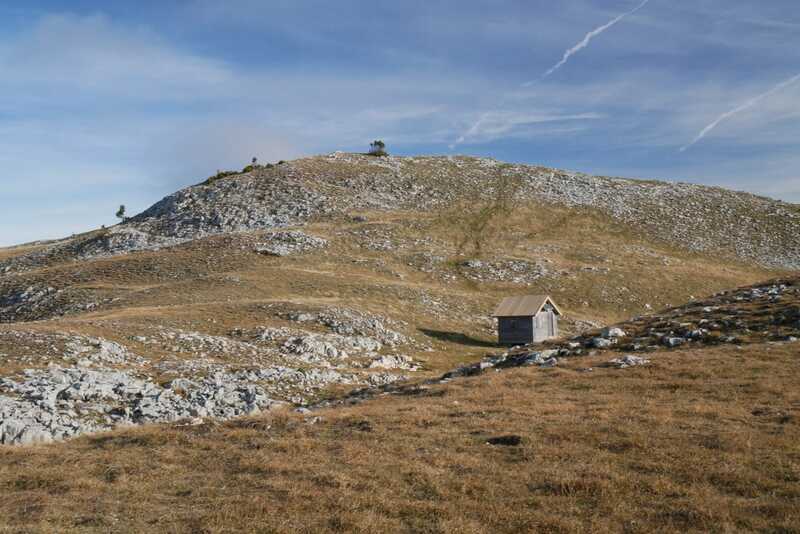 We reach the GR91 a little further north-east of the “Grande Cabane”. 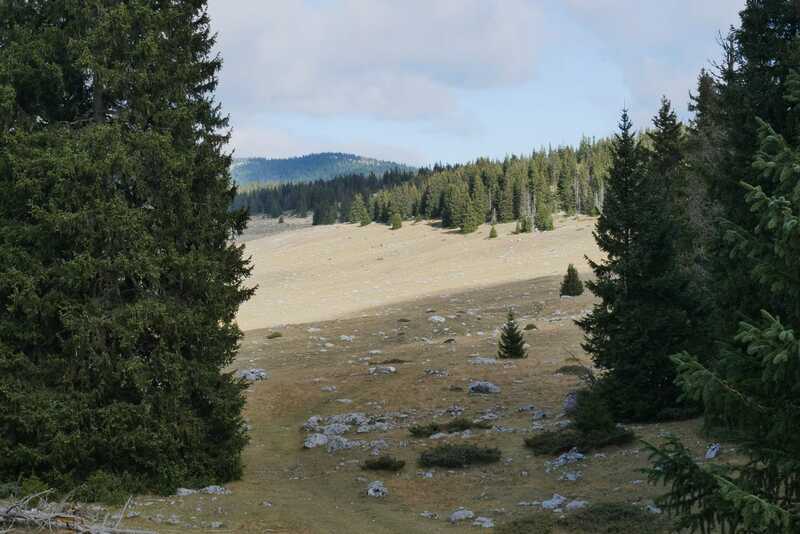 We will now follow GR passing through the Vercors from one side to the other. North direction. We stop a little further just before the fountain of Serrons to have a break. The view is beautiful on the Grand Veymon. We continue towards the fountain of Serrons. Even though we were told it was dry we made a 100m detour to see. And of course it does not run very well but it flows ! So we decided to fill all the bottles with good clean water (half was filled with melted snow and not very clean). Well it takes 10min per bottle and we have 6 bottles to make … A long break in perspective, but it’s okay we are well there waiting in the sun. 9L later we resume our way with the sun in the back. 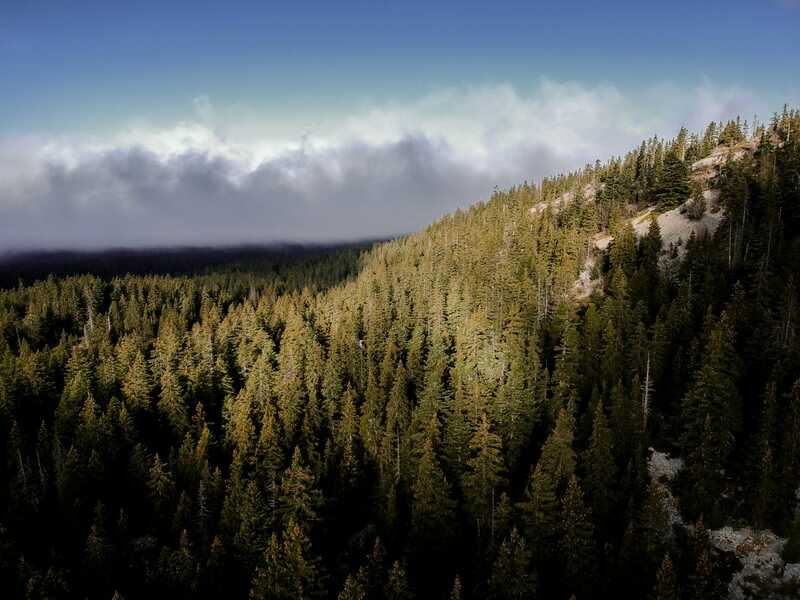 Landscapes oscillate between fairly rocky ground forest and open spaces where crossing bison would not be surprising. We move quickly, it’s pleasant. 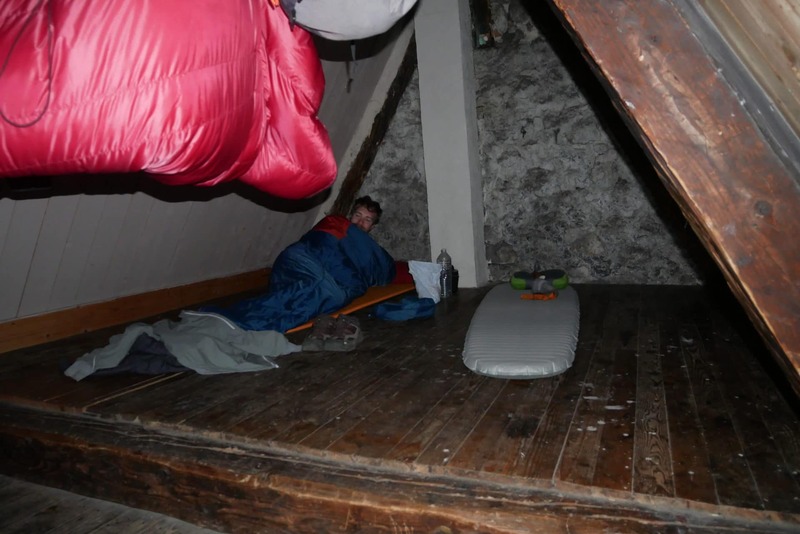 We have not met many people since we left the Aiguillettes cabin. 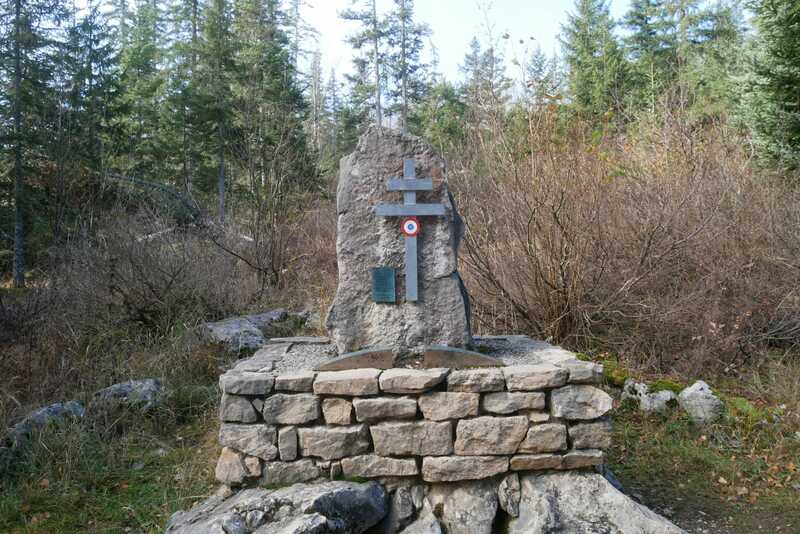 Further we cross the fountain of La Chaux which does not run almost (just a drop by drop). We recover some water that stagnates in the pipe to drink at the break. 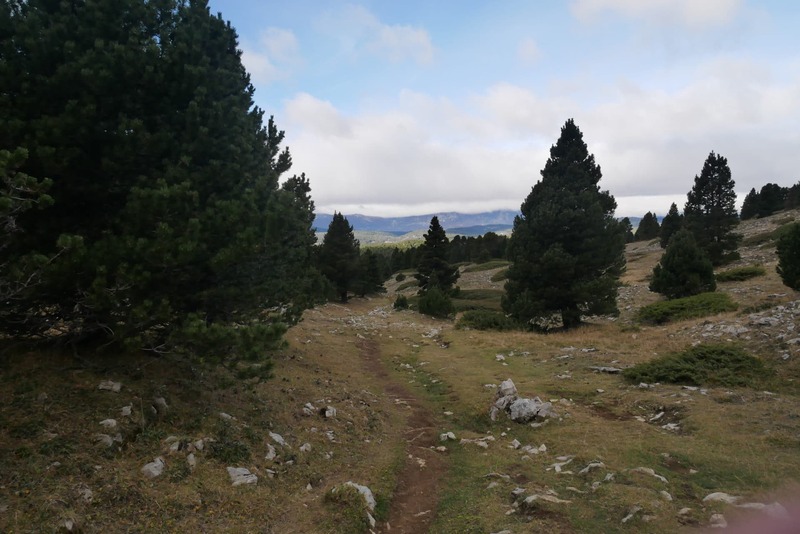 We continue our road in the maquis for another 2km towards the fountain of Playe, we plan to bivouac nearby hoping to find enough water. And we are lucky because the fountain still has an acceptable flow. So we will have enough water tonight to drink our thirst and cook. We set up the camp next door. The view is beautiful from here but the temperatures drop quickly with the twilight and it is windy again. We will have a good meal rich in comparison with the day before but we will not linger outside because it is freezing tonight. Direction the sleeping bag at 6:30pm to fall asleep not long after. 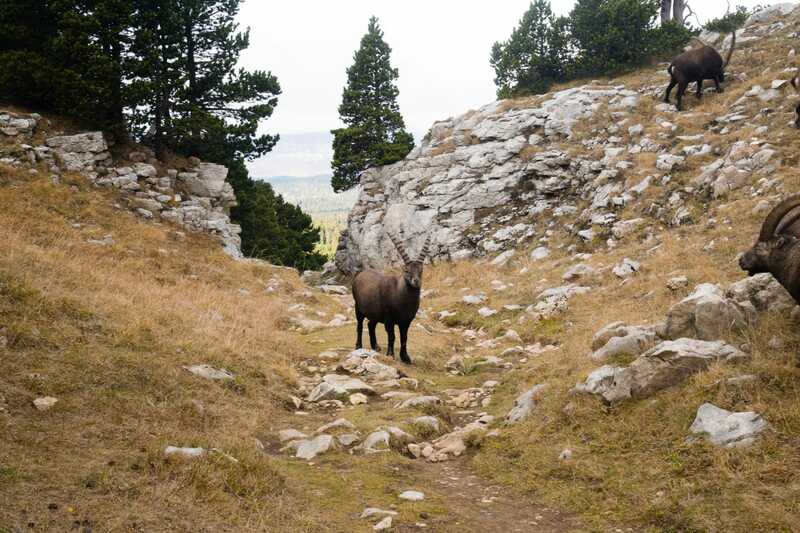 A nice day with a lot of diversity in terms of landscape and especially a real immersion in the wild Vercors. Fresh night but no problem with our warm sleeping bags. The breakfast will be nicer than the day before because we have water. 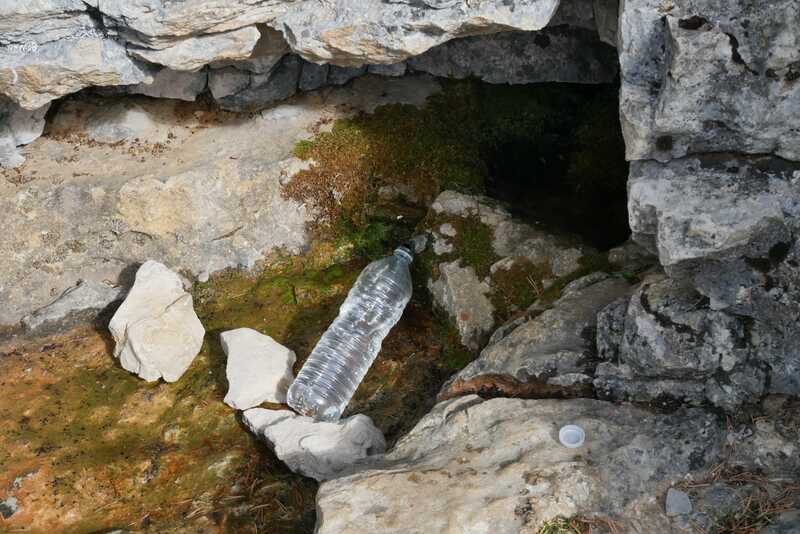 We also refuel the bottles before we leave because we will not cross other fountains and tonight we will be at the Carrette’s Cabin, so we need stock. The path then continues through the forest and through small depressions. There is a pleasant maze of rocks and tree. 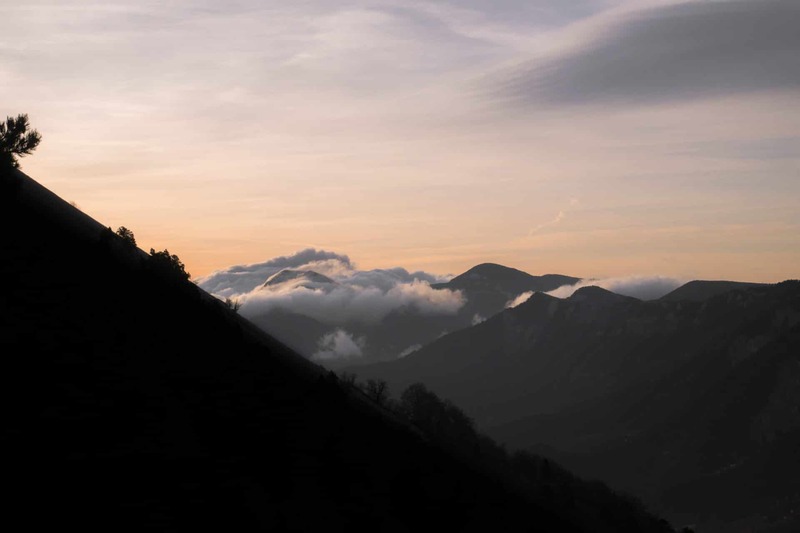 A little further, not far from the Head of Cognaux, we overlook the forest and the rising sun offers a beautiful light. 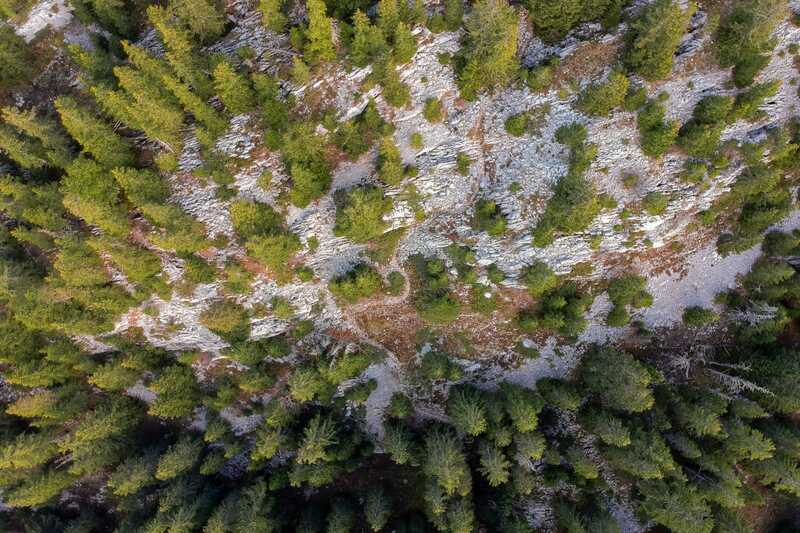 We take the opportunity to take a break and take aerial photos because we can finally fly the drone since the wind has fallen. 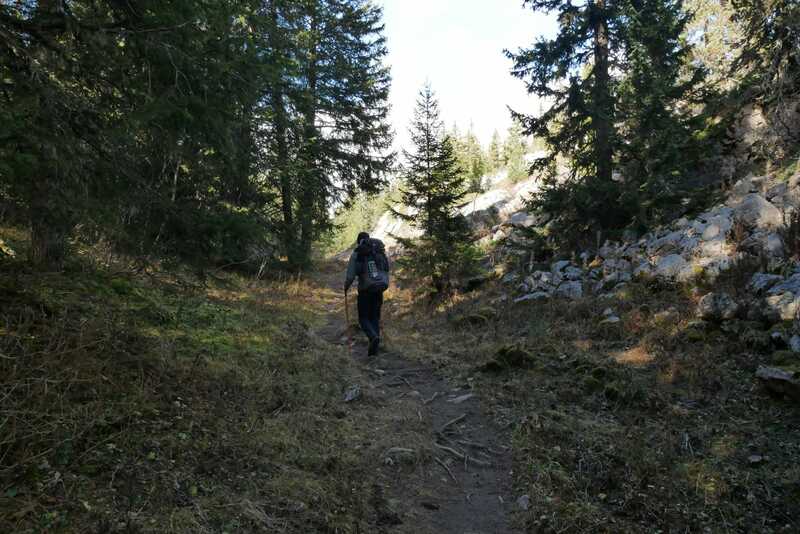 We continue our route along the GR91. The landscapes are so beautiful. The progression is fast since the day before we are on a flat downhill. The GR91 then takes us through the Canyon of Erges. So it’s not the Grand Canyon either, but it’s original, the trail is steeped between two cliffs of about 20m high with sometimes some organic shapes. 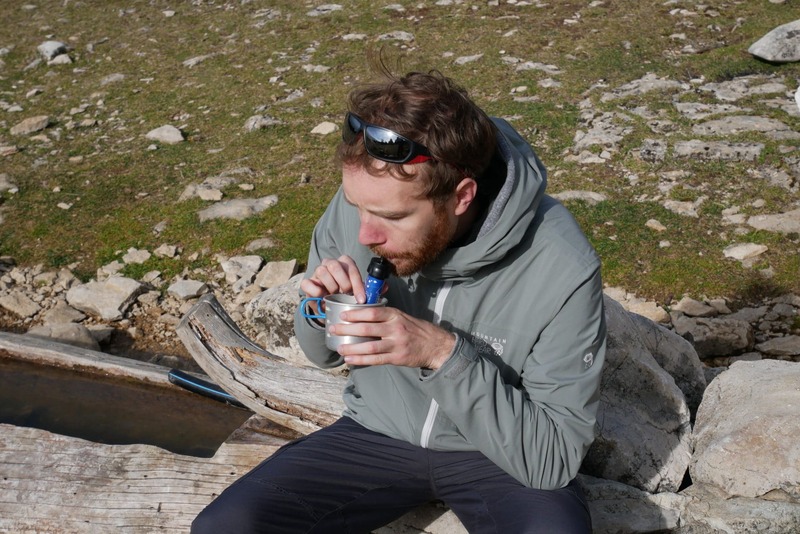 Small meal break not far from the “Pot du Play” after crossing the canyon. 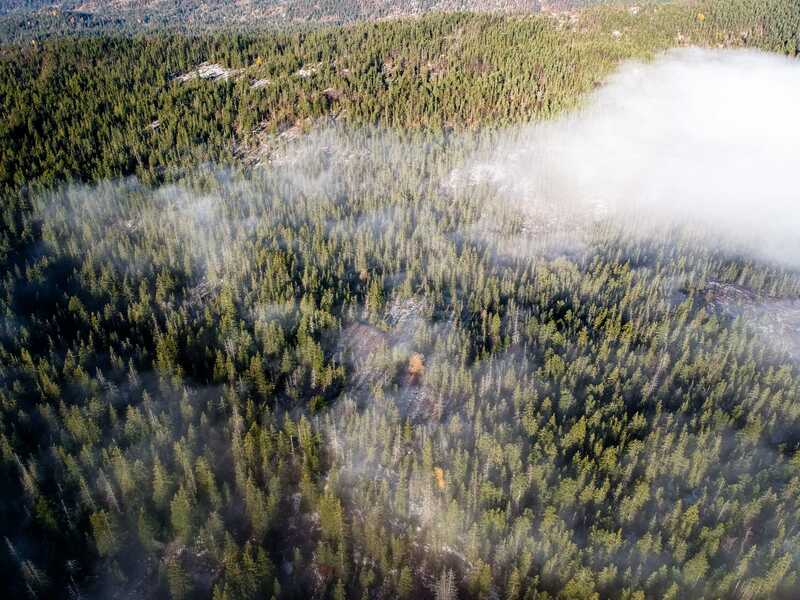 We have lost a little altitude since this morning and it is felt by the presence of more and more numerous hardwoods. We then quickly reach the plain of Darbounouse. I find this place beautiful especially when we are there because the clouds created games of shadows on the ground, quite beautiful. It’s like being in the American Great Plains and we would not have been surprised to see a herd of bison grazing. Photo shoot to immortalize the moment. Back in the forest we do not have much distance to the Carrette Hut. 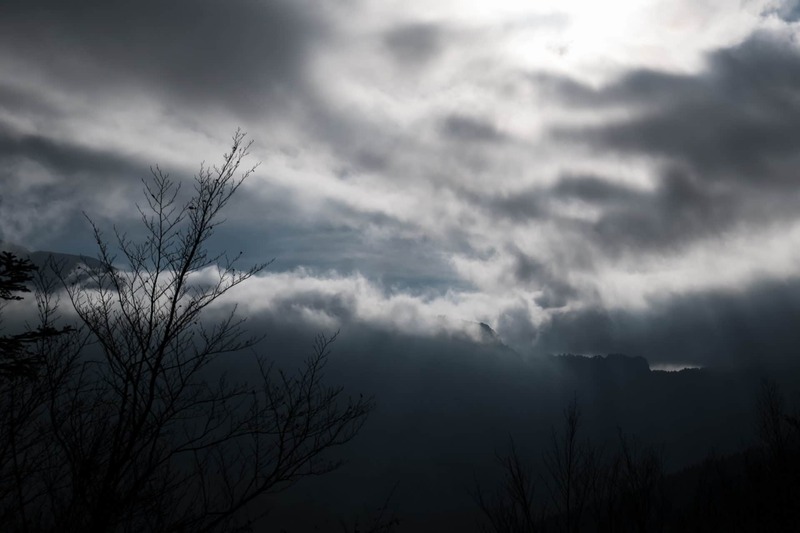 The weather quickly turned gray and temperatures dropped in the process. 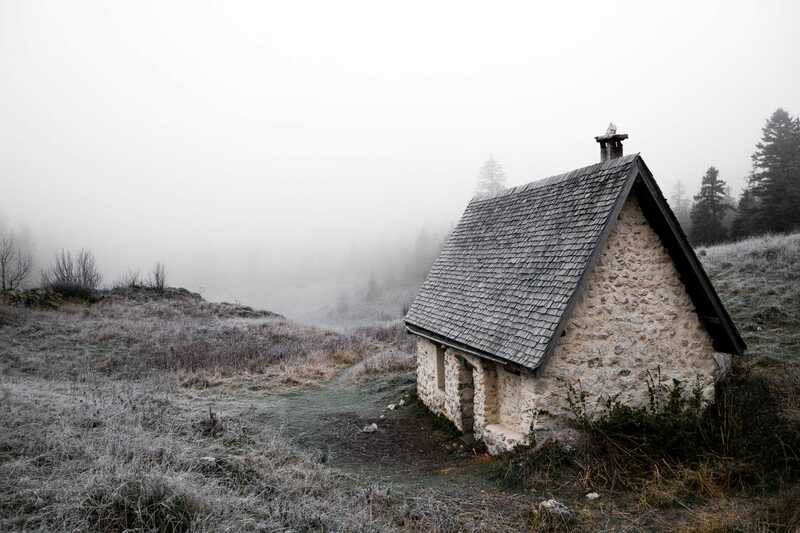 We arrive relatively early at the cabin which is nestled in a small depression east of the road. We could have continued to Corrençon but we wanted to enjoy this last night in the forest. The cabin is already occupied by a mother, her daughter and a friend, we share a tea before they go back home. 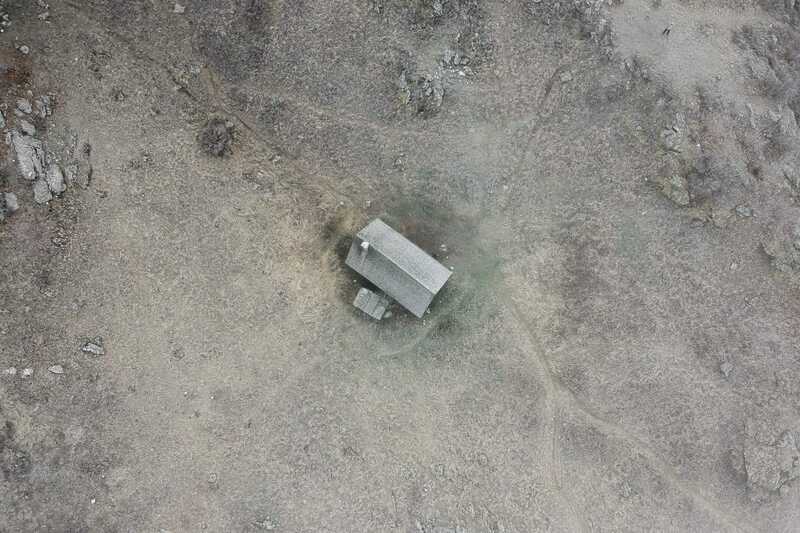 The hut could not be more simple: a rectangular hold with a stove in a corner and a table in the middle of the room, at the bottom a staircase leads to the floor, a simple wooden floor, intended to sleep. Without being clean is not too dirty either, it will be fine for tonight. Our loneliness is quickly interrupted because two travelers arrive: a girl and her little brother who also come to spend the night here. The hour passes quickly and we are already at the meal where we share our food. 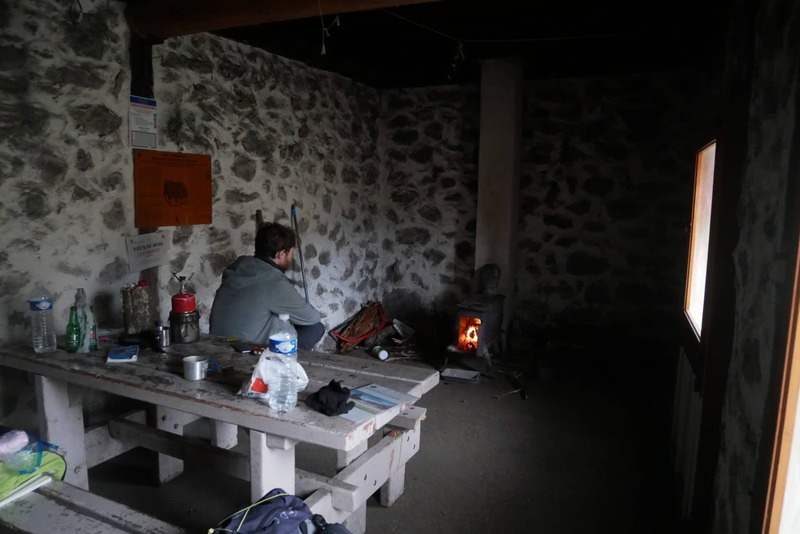 The stove heats very little and we are not unhappy to be 4 to warm the cabin a little. We are back alone. We enjoy the end of the evening calm and cold in the light of the candle! Bucolic! Early sleeping, tomorrow return to civilization. We did not sleep badly even though it must have been cold outside as evidenced by the beautiful frosty landscape that awakens us. Past this contemplative moment, we fold the bags one last time, we then leave, to ward Corrençon-en-Vercors. 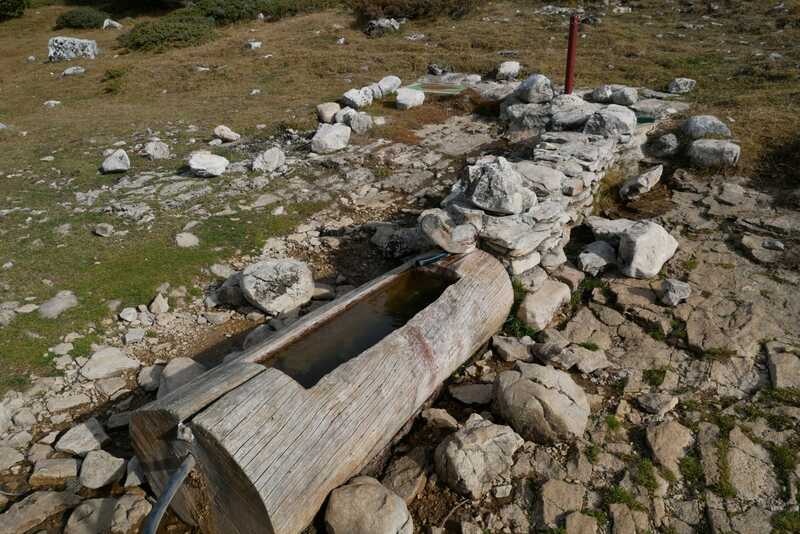 But before that we make a small detour through a cave not far from the hut that houses a spring. It is found after some hesitation. The place is quite nice and especially practical if you need water. We then take the direction of the village. 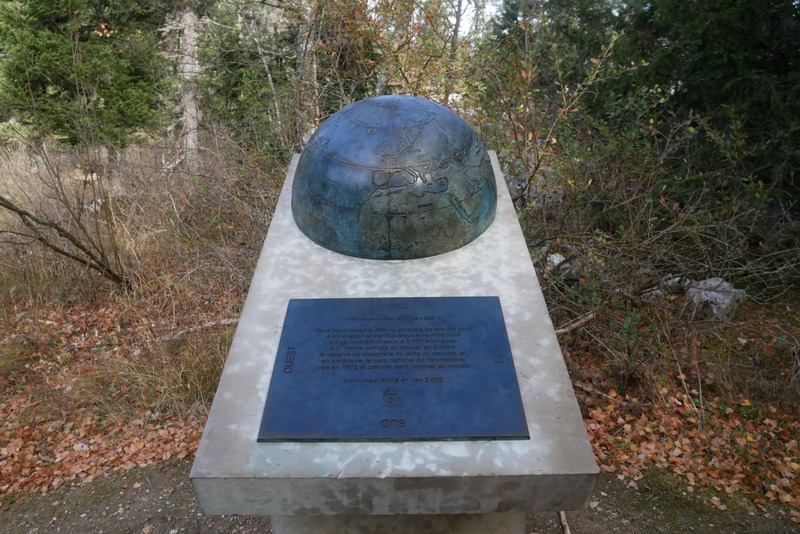 The path goes through a double place of interest : the 45th parallel mark that symbolizes this latitude and a monument to the memory of the Vercors guerrillas because the High Plateaux were a place of the Resistance during the Second World War. 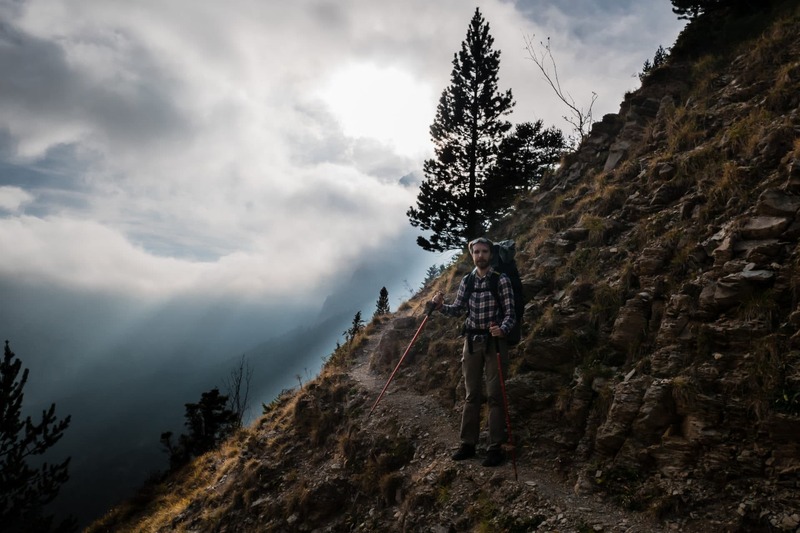 The path that follows takes us back to civilization. It becomes almost drivable and meanders between golf and cross-country ski circuits … We arrive in Correçon-en-Vercors shortly thereafter. 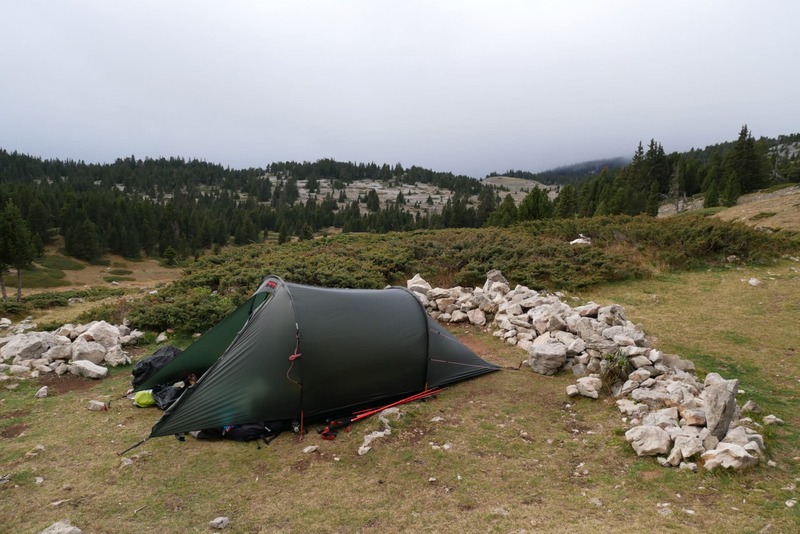 The Vercors will have kept its promises: what an extraordinary place! 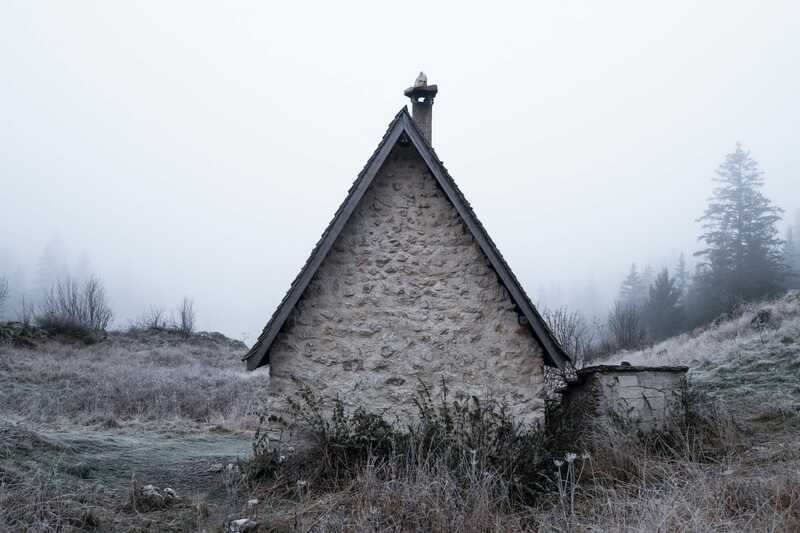 Only 1 hour drive from Grenoble and so isolated. There is really a feeling of end of the world here. I was particularly surprised by the variety of landscapes and their staging, in only 100m of altitude one passes from the grassy plain to the forest then to barren lands. The hike itself is really nice and accessible. 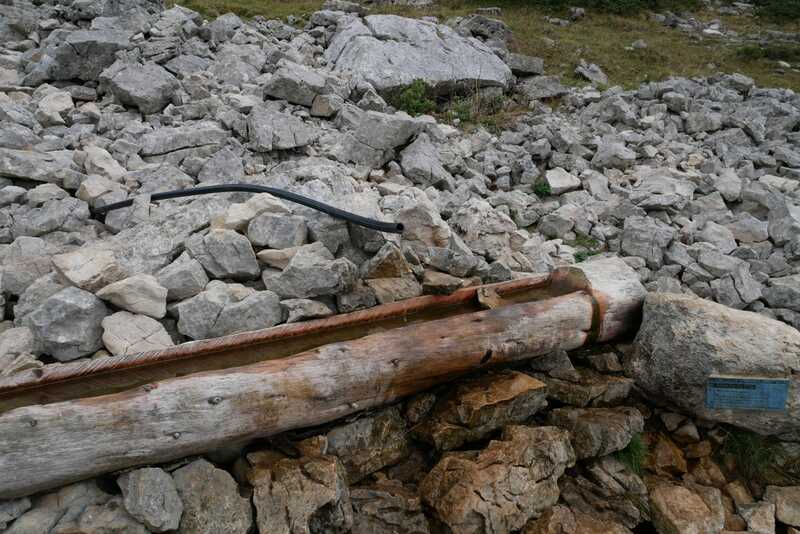 The only point of attention is the water, it is necessary to inquire a little in advance but there is this site to know the state of the fountains: Link. 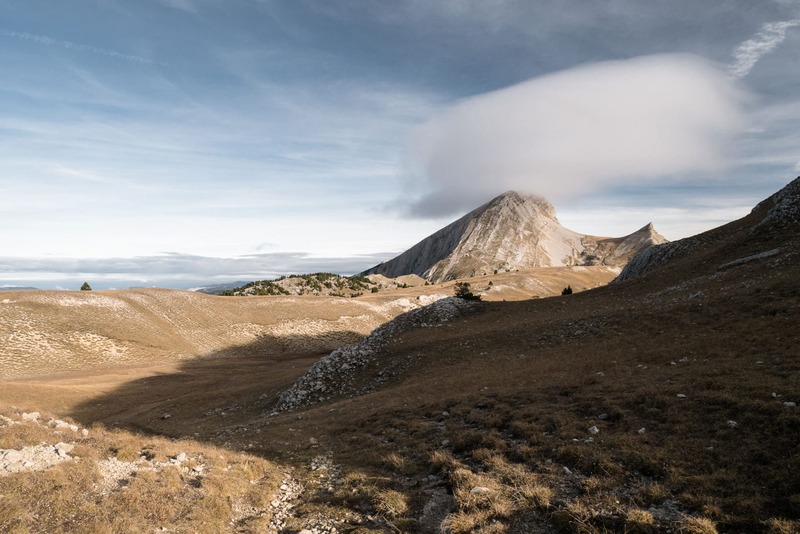 I advise you to go discover this beautiful corner of France as well in summer, autumn or even in winter ski touring or snowshoeing.